After EISCO completed the bulk removal of asphalt from a 27’ diameter x 40’ height asphalt storage tank, we proceeded to hydro blast and clean the wall surface of the internal tank up to the ceiling for purpose of preparation for inspection and weld repair. 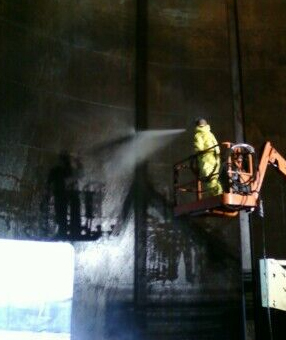 EISCO utilized a 40,000 ultra-high water blaster to clean the tank wall surface. Scaffolding was erected inside the tank up to 30’ in order to clean the walls from ceiling to floor. EISCO finished with vacuum removing water and debris with a vacuum truck and transferring it to an approved facility.